The EngiNERDs would like to extend a special thank you to all of the Teams that attended our Strategy Dictates Design Seminar, Kit of Parts Chassis Build, and workshop seminars. If you missed the workshops, but would like access to our resources, please head over to our EngiHELPdesk. Join us for our Robot Boot Camp and Open House! Parents and Students in the GBHS Graduating class of 2019-2022 are invited to join us for a two-night crash-course in everything EngiNERDs! Come one or both nights to learn what Team 2337 is all about. All Participants under the age of 18 must complete our Release of Liability (click link for form) in order to attend. Please print a copy, fill it out, and bring it with you on the first night you attend. MINORS WILL NOT BE PERMITTED TO PARTICIAPTE WITHOUT THIS FORM. Forms for Adults will be available at the event, and must be completed before participation. ​The Grand Blanc High School Varsity Robotics Team – The EngiNERDs, competed in their first district event of the 2018 season at St. Joseph High School, in St. Joseph Michigan on March 8, 9 and 10. The Team finished with a record of 9-3-0, and was the 4th seed at the close of the qualification matches. The NERDs went on to Captain the 4th seeded alliance alongside Team 4237 – Team Lance-A-Bot from Stevensville, MI, and Team 288 – The RoboDawgs from Grandville, MI. The Alliance finished the event as Semi-Finalists. The EngiNERDs also contended for the District Chairman’s Award, which is the most prestigious award in FIRST Robotics. It honors the team that best represents a model for other teams to emulate and best embodies the purpose and goals of FIRST. This Award was created to keep the central focus of FIRST Robotics Competition on the ultimate goal of transforming the culture in ways that will inspire greater levels of respect and honor for science and technology, as well as encouraging more of today’s youth to become scientists, engineers, and technologists. 2018 Day After Kickoff Workshop: Thank you! Thank you to everyone who came to our workshop, and to all those who volunteered! ​Please remember that you're all a part of the EngiFAM now, and we're always here to support you and lend a hand when you're in need, so feel free to contact us if you have any questions this season. We wish you all the success in this upcoming season! Each week, the EngiNERDs will be broadcasting our new #EngiLIVE show on our YouTube Channel. Ask a question online by tweeting to the hashtag #EngiLIVE, by posting them on our Facebook page, or by asking them on the YouTube live stream in the comments section! From Workshops to demonstrations, and conference calls to Slack Channels, we as the EngiNERDs focus our efforts on assisting other FIRST Robotics Teams and paying "FIRST Forward" to others. We believe that spreading the word of FIRST and promoting STEM education can help show the world that it really is cool to be a NERD. The EngiNERDs competed in Michigan's final "FIRST Steamworks" Robotics Event for the 2017 FRC Season at Bloomfield High School on November 11. This event was designed to encourage young women to participate in Robotics, and required the Drive Team and Pit Crew to be all female Team members. All members of the Team worked together to scout and maintain the Robot. The Team finished Qualification Matches with a 5-1-0 record, and were the Captain of the First Seeded Alliance. Thanks to the amazing scouting data that was collected, inputted, and examined by Team Members, The EngiNERDs selected Team 33 - The Killer Bees (from Notre Dame Prepatory Academy in Pontiac), Team 4961 - Shock and Awesome (from Almont High School, in Almont) and Team 240 - Tempest (from Jefferson High School in Monroe). The Alliance went 6-1-0 throughout the Playoff Matches, and won the event. The EngiNERDs will begin building a new FRC Robot beginning in January, to play FIRST Power Up! Until then, please look for updates on the EngiNERDs VEX Robotics Teams, which will be competing at the Center for Innovation in Lapeer on November 18, and at Notre Dame Prep High School in Pontiac on December 16. Help us Heal Local Kids! Each year since 2011, The EngiNERDs have joined forces with Extra Life to help kids at Hurley Children's Hospital, right here in Flint, Michigan. We've gamed together to raise over $19,200.00 these past 6 years, and we're not stopping there! So join us on November 4th - wherever you are - and get your game on #ForTheKids! The Grand Blanc High School Robotics VEX and FRC Teams are currently recruiting new Team Members. Our VEX Teams meet year-round to provide all GBHS Students an introduction to Robotics, before joining the FIRST Robotics Team. The FIRST Robotics Competition (FRC) Team is open to Students who have participated in one season of VEX, and have completed a series of milestones in Robotics education and training. 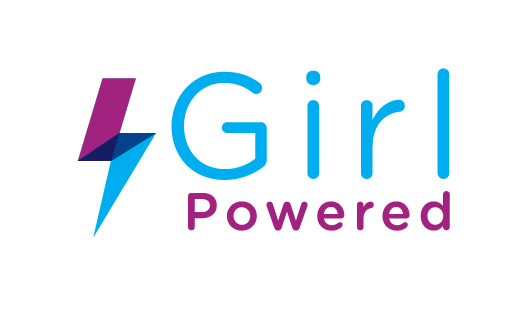 About our Girl Powered Events! On the EngiNERDs, we believe that STEM is for everyone! Come meet and learn from Team 2337’s EngiLADIEs, with FREE demonstrations and Hands-On activities beginning at 10:00am on Saturday, October 14th in the Cafeteria. ​This workshop is designed to inspire young women to grow confidence and increase their participation in robotics, but we also encourage boys and young men to attend. ​Team 2337 – The EngiNERDs, competed at the FIRST Robotics Michigan State Championship this weekend alongside 160 of the top Teams in the State. The Team played 12 qualification rounds and placed first in their division, with a record of 10-2-0, and selected Team 107 – R.O.B.O.T.I.C.S. (from Holland Christian School in Holland) and Team 5561 - Raider Robotics (From Flushing High School in Flushing). The alliance went on to win the DTE Energy Division, and participate in the Championship semi-finals, and were eliminated by the event winning alliance of Teams 33, 2834 and 469 (the Killer Bees from Notre Dame Prep in Pontiac, Bionic Blackhawks from Bloomfield, and Las Guerrillas from Bloomfield International Academy). The EngiNERDs also earned the General Motors Industrial Design Award, which celebrates form and function in an efficiently designed machine that effectively addresses the game challenge. Criteria for earning this award include: elegant, efficient and practical design, reliability and maintainability, capability of withstanding the rigors of the contest and ease of service. The entire machine design, or the detailed process used to develop the design is worthy of this recognition, and not just a single component. The Team’s performance within the 2017 Season and MSC has earned the EngiNERDs a spot at the FIRST Robotics Championship in St. Louis on April 26-29, with 400 of the best FRC Teams from around the world. The Team will be holding a can drive at the old K-Mart in Grand Blanc on Saturday, April 22 from 9:00am to 8:00pm to raise the more than $20,000 needed to attend the event. Please contact Brandi Bolinger at bbolinger@gmail.com with questions or to make a donation to the Team. The Grand Blanc High School Varsity Robotics Team – The EngiNERDs competed at the Kettering University District Competition on March 9, 10 and 11, 2017, with their Robot, NERDx. The Team competed in 12 qualification matches, and ended with a record of 8-4-0, and Captained the 4th Seed Alliance during the Playoffs, alongside Team 1506 – Metal Muscle, from North Oakland County, and Team 5046 – The Jacked-Up Jackets from Memphis. The NERDs’ Alliance fought through the semi-finals, and were eliminated after four matches. ​The Team earned the Gracious Professionalism Award, which celebrates outstanding demonstration for FIRST Core Values such as continuous Gracious Professionalism and working together both on and off the playing field. Two Students – Alexis Limban and Lauren Navock - were recognized as nominees for the FIRST Dean’s List award, which acknowledges outstanding student leaders whose passion for and effectiveness at attaining FIRST ideals is exemplary. Co-Head Mentor, Brandi Bolinger was nominated for the Woodie Flowers Award, which is presented to an outstanding Mentor in the robotics competition who best leads, inspires, and empowers their team using excellent communication skills, and will go on to compete for this honor at the Michigan State FIRST Robotics Championship. FLINT (WJRT) (03/08/17) - Over the next few days, hundreds upon hundreds of junior tech gurus and engineers will be making their way to Flint. 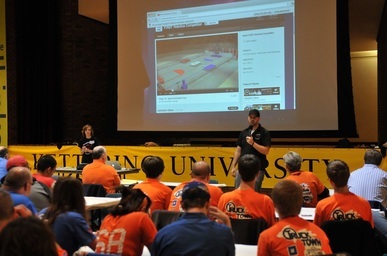 It's all for a huge FIRST Robotics competition that's taking over Kettering University. Kettering's recreation center has been transformed into a robotics arena, with teams practicing Wednesday. Competitive action begins on Thursday and runs through Saturday. 2017 Robot - NERDx - Revealed on The RoboSports Network check_in! Build Season Week 3 on check_in! To help Teams develop a game strategy that is adapted for their specific abilities and needs, the EngiNERDs are hosting an interactive, hands-on workshop the day after FIRST Kickoff. Veteran and Rookie Teams are invited to attend, and will gain valuable knowledge about strategy, and have the opportunity to build their Kit of Part (KoP) Chassis. In order to attend the Kit of Parts Chassis Build, Teams will need to attend the "Strategy Dictates Design" portion of the day. During this time, Members of Team 2337 will sort your Kit of Parts and distribute mechanical and electrical parts to the appropriate area, and also begin installing/updating necessary software on your Team's Laptop/Classmate PC. ﻿Interested in joining the GBHS Robotics Team? To help provide participation opportunities for all Students who are interested in joining the High School Robotics Team, we have developed a year-round J.V. Robotics Program, which will compete in the VEX Robotics Competition. ​The Grand Blanc High School Robotics Team, The EngiNERDs, had a great showing at the Troy FIRST Robotics District Competition, which was held March 31 through April 2, 2016 at Athens High School. With a record of 10-2-0, the Team went on to Captain the 2nd Alliance, and compete alongside Team 3539, The Byting Bulldogs from Romeo High School and Team 6013, The Robowolves from Cornerstone Health + Technology High School in Detroit. Through the Playoffs, the Alliance competed in 8 hard-fought matches and finished as Event Finalists. The outstanding Robot performance has qualified the EngiNERDs to compete as one of 102 of the top FIRST Robotics Competition Teams at the FRC Michigan State Championship, held April 13 through 16 at the Deltaplex in Grand Rapids. The EngiNERDs also earned the prestigious Engineering Inspiration Award, which celebrates outstanding success in advancing respect and appreciation for engineering within a team’s school and community. This award is presented to the Team that is recognized as having passion, knowledge and commitment to furthering STEM education. The Team will compete for this award at the Michigan State Championship. Change. That's what Team 2337 is all about. We aim to bring positive light to science, technology, engineering and math, and make it "cool to be a NERD'. We want our community to know that young people CAN make a difference. A huge one. If you'd like to know more about our mission, check out this video. Inspired? Feel free to contact us to find out what you can do to change the world, too. Awesome Job! Whether you are a Rookie or Veteran FIRST Robotics Team, you did a great job participating in our Strategy Dictates Design, Team Organization, Awards, or Kit of Parts build. Here is an exclusive behind-the-scenes video of creating the Kit of Parts Chassis plus building a moving chassis, less than 24 hours after the 2016 FIRST Robotics Game Stronghold was announced world wide. Support our Extra Life Team! Extra Life is a 24-hour Gaming Marathon where the EngiNERDs raise money for Children's Miracle Network at Hurley Hospital in Flint, Michigan. How can you help? Try one of these two ways: Sign up to participate by creating a fundraising account, or donate to a player. At Michigan's first VEX Competition for the 2015 season, Team 2337's A-Team won the Excellence Award, and was awarded the first seat at the Michigan State VEX Championship in April. This is the highest award presented in the VEX Robotics Competition. The recipient of this award is a team that exemplifies overall excellence in building a well-rounded VEX robotics program. This team excels in many areas and is a shining example of dedication, devotion, hard work and teamwork. As a strong contender in numerous award categories, this team deserves to be recognized for building a quality robot and a "team" committed to quality in everything that they do. EngiNERDs Qualify for FIRST World Championship! With excellent combined performance from the Kettering and Troy District Competitions, the EngiNERDs ranked 7th out of more than 340 Teams in the state of Michigan, and were one of 102 Teams that qualified for the Michigan State FIRST Robotics Championship in Grand Rapids. The NERDs were selected by the 16th seed, and were quarter-finalists with Team 85 (BOB, from Zeeland East High School in Zeeland) and Team 2054 (The Tech Vikes from Hopkins High School in Hopkins) with an average playoff score of 176.25. The Team received the prestigious Industrial Design Award, which is sponsored by General Motors, and celebrates form and function in an efficiently designed machine that effectively addresses the game challenge. Students must be able to explain and demonstrate the function(s) of the Robot, and describe why the features were selected as part of the Robot Strategy. At the conclusion of the Michigan State Championship, The EngiNERDs were ranked 9th, and qualified for the FIRST World Championship in St. Louis on April 22-25. 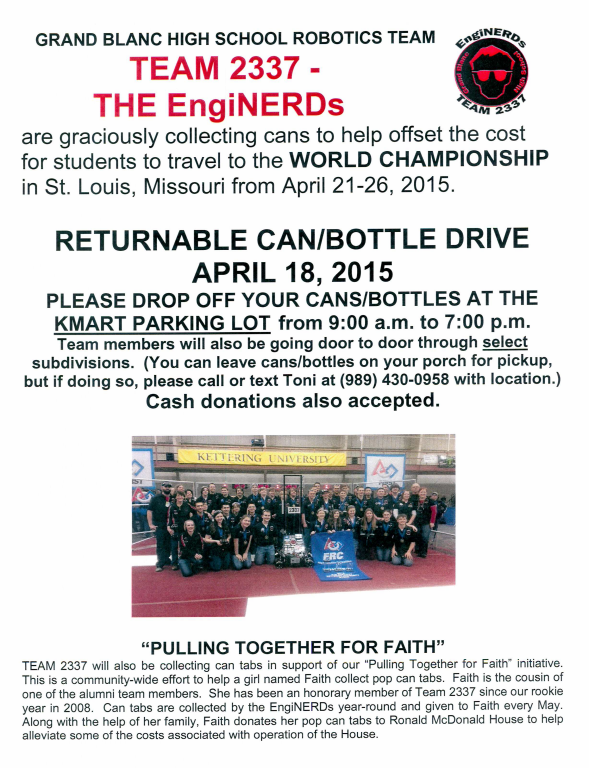 To help offset the nearly $20,000 it will cost the Team to attend the World Championship in St. Louis, the EngiNERDs are accepting donations and will be holding a can drive in the old Farmer Jack parking lot on Saturday, April 18 from 9am to 8pm. Premier Tooling Systems Named "Hometown Hero"
Premier Tooling Systems, based in Grand Blanc, Michigan has been providing a home for the EngiNERDs since 2008. During evenings and weekends, Premier opens its doors to allow Team 2337 access to more than 17,000 feet of precision machinery and provides a build space. The EngiNERDs nominated Thom and Rick, owners of Premier Tooling Systems, for the Grand Blanc Chamber of Commerce "Hometown Hero" award, which recognizes a business that unselfishly demonstrates outstanding community service to their area. Upon winning the award, Thom said in his acceptance speech, "None of us here do what we do for the recognition. We do it because we like to contribute to the support of the community, and to the support of the Youth in our community; the future leaders of our community. I really don't do anything but share what I have." Thom and Rick have always been Heroes to the EngiNERDs, and we are honored to recognize them as the "Hometown Hero" of Grand Blanc. 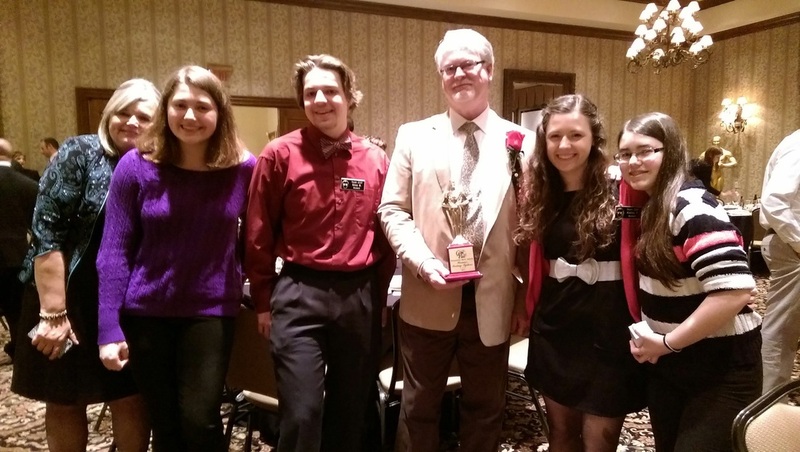 2015 Kettering University District Competition Champions! 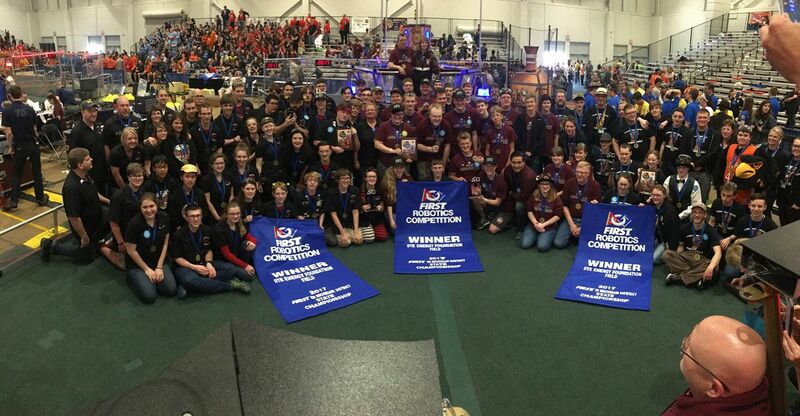 The EngiNERDs competed in the Kettering University FIRST Robotics District Competition on March 5, 6, and 7, 2015. The Team finished their 12 qualification rounds in 2nd place of 41 Teams. Along with Teams from Carman-Ainsworth (Team 314, the Megatron Oracles) and Vassar High School (Team 5784, V2OVH), the alliance swept the 7 Elimination rounds and were winners of the Event. The EngiNERDs earned the Industrial Design Award, sponsored by General Motors, which celebrates form and function in an efficiently designed machine that effectively addresses the game challenge. The Team also earned the Industrial Safety Award, sponsored by Underwriters Laboratories, which celebrates the Team that progresses beyond safety fundamentals by using innovative ways to eliminate or protect against hazards. Juniors William Garland and Michael Olmsted were nominated for the "FIRST Dean's List" award, for demonstrating leadership and commitment to the ideals of FIRST, their effectiveness at increasing awareness of robotics in the school and community, and for their technical expertise and passion. 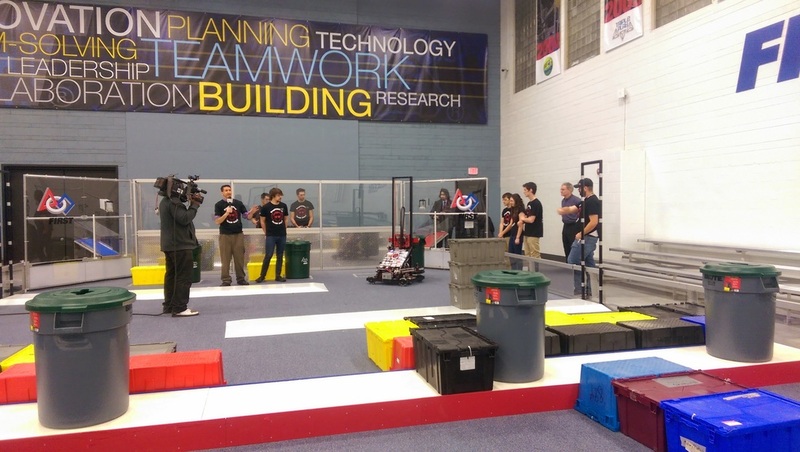 The EngiNERDs reported for media duty at 4:45am on March 4 at the Kettering University FIRST Robotics Community Center for a story with ABC12's Marc Jacobson. The Team, along with the 2014 Robot, "Scorpion" made a debut on the morning news, and were featured on the ABC12 Facebook, Twitter and you can Watch the Video Here. 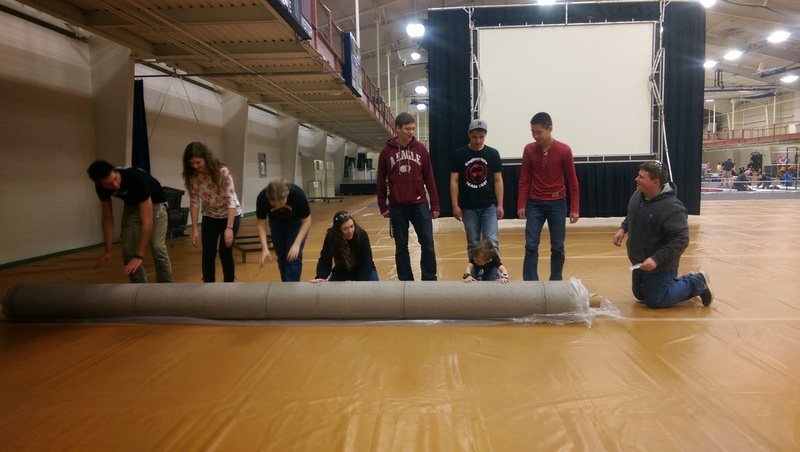 As members of the Kettering University District Competition Planning Committee, the EngiNERDs have the opportunity to assist with set-up and tear-down of the event. Responsibilities include building the field and practice field, assembling the pits, and arranging the meal area. Team 2337 has been a member of this committee, and the September Kettering Kickoff Event, since their Rookie Year in 2008. Congratulations to our VEX D-Team for qualifying for the Michigan State Championship, held at MSU on February 22, 2015. The Team won the Notre Dame Prepatory Tournament in December, which allowed the Team to qualify. The Team was ranked 32nd at the conclusion of the competition. The EngiNERDs had the opportunity to bring Practice Bot to our Partners at Kettering University to compete at the FIRST Robotics Community Center, alongside 15 other Teams from the Mid-Michigan Area. For the first time in Team 2337's history, we hosted a Partner Showcase. We invited all of our Program Partners to our facility, Premier Tooling Systems, on stop-build day for an exclusive sneak-peek at our Robot. The EngiNERDs Student Section Leaders gave a season-overview which outlined the entire season’s progress, and explained how we came up with the Robot design that we did. Students and Mentors were given the opportunity to network with the EngiNERDs' Partners, and the Partners were able to see the hard work and dedication put forth by Team Members. Thank you to the 40 Teams that attended The EngiNERDs 2015 Day-After Kickoff Workshops. Whether you participated in the Strategy Dictates Design, Team Organization, Awards, or Kit of Parts build, THANK YOU! Here is a behind-the-scenes look of what went into creating the Kit of Parts Chassis build a huge success, and allowed Team 2337 to assist FIRST Robotics Teams in creating over 30 moving chassis, less than 24 hours after Recycle Rush was announced. Read more on the FIRST Robotics Competition page. To help Teams develop a game strategy that is adapted for their specific abilities and needs, the EngiNERDs are hosting an interactive, hands-on workshops the day after FIRST Kickoff. Veteran and Rookie Teams are invited to attend, and will gain valuable knowledge about strategy, and have the opportunity to build their Kit of Part (KoP) Chassis. A new Team Organization workshop will help teams get prepared for the season and run smoothly. REGISTRATION IS NOW CLOSED. Please contact one of the Team's Head Mentors with any questions or concerns. Due to size regulations and safety concerns, this year's workshop will be limited to 15 members per Team, including students, parents and Mentors. We recommend a minimum of 3 students for Mechanical, 2 students for Electrical and 2 students for Programming, plus one Mentor for each Section. The Team Organization workshop is open only to Mentors. Membership is open to all Students at Grand Blanc High School. There's something for everyone! Each year, the EngiNERDs participate in Extra Life, a 24 hour gaming marathon to raise funds for Children's Miracle Network at Hurley Medical Center in Flint. This year, we're asking for your help. Support a Player. Join our Team. Come out for the Euchre Tournament. Do something to help us reach our goal. 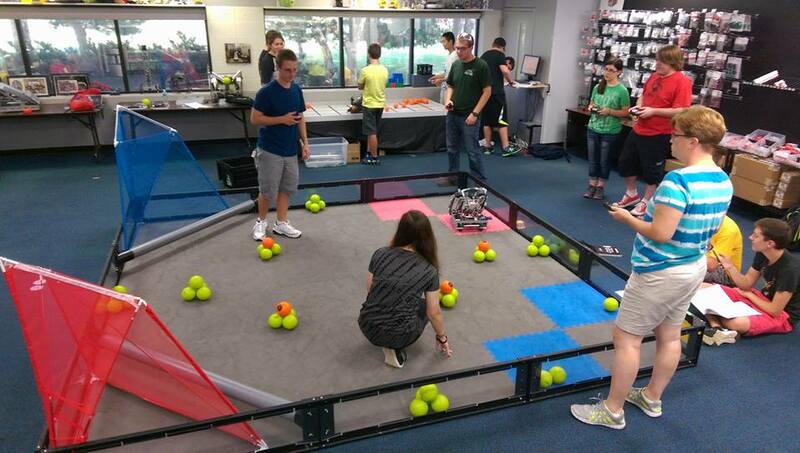 Each summer and fall, the EngiNERDs utilize the VEX Robotics Program to engage students in the off-season. The NERDs form four VEX Leagues (A, B, C and D Team), which are open to Grand Blanc Students graduating from 2015 through 2020. Meetings take on Mondays and most Thursdays. It's been seven years since the EngiNERDs began, and the Team would love to see all of its Team Members, EngiFam, Alumni and Partners at this summer's BBQ! Please join us at the home of our Partner, Tropical Smoothie of Grand Blanc, for a Demo Day with a Tropical Twist! The Team's 2014 FIRST Robotics Competition Robot, "Das Bull" (featuring "The Clawbots") will be out crusin' the parking lot. We'll have dancing, tattoos, and robots for you to drive. Remember to stop by the restaurant, because Tropical Smoothie will continue their partnership with the EngiNERDs by donating 15% of your bill back to the Team. We truly appreciate your support. Check out our Team's Facebook Event Page for more information. Wondering what the EngiNERDs are all about? The Grand Blanc High School Robotics Team meets year-round and has events planned through the Summer and Fall. Events are open to the public, most are free! The NERDs are heading to the FIRST Championship in St. Louis on April 24 - 27, where 400 Teams from around the World will compete. The EngiNERDs are seeking the support of the Grand Blanc Community and beyond. The Team is holding a returnable can and bottle drive on Saturday, April 19 in the Saginaw-Side of K-Mart's Parking lot. The Team relies on the funds from this to help pay for the students to go to the FIRST World Championship in St. Louis at the end of the month. Students will be walking some of the subdivisions collecting cans and bottles, and we will be accepting drop-offs and donations at our camp in the K-Mart parking lot. We will be collecting can tabs for our "Pulling Together for Faith" FIRST Philanthropy effort. For more information on how to join "The Pull", please visit our FIRST Forward page. Heading into the Michigan State Championship, held at Eastern Michigan University in Ypsilanti, the EngiNERDs were ranked Number one, based on win-loss record and the awards the Team received. The Robot played to a 11-5-0 record, earning the second seed Alliance Captain position, and allowed them to select Team 469, Las Guerillas (from International Academy of Bloomfield Hills(, and Team 2834, The Bionic Blackhawks (from Bloomfield Hills). The alliance was eliminated in the semi-finals by the Teams who went on to win the event. The EngiNERDs earned the Motorola Quality Award, which Celebrates machine robustness in concept and fabrication. At the conclusion of the event, the Team ranked 5th of 276 Teams in the State. The Troy District Competition proved to be fierce, where the Team performed to a 14-4-0 record, earned the First seed position, paired up with Teams 3539, the Byting Bulldogs from Washington, and Team 3302 the Turbo Trojans from Clawson. The Allaince was eliminated in the finals. The NERDs received the Xerox Quality Award, which Celebrates creativity in design, use of component, or strategy of play. The Grand Blanc High School FIRST Robotics Team 2337 had a great weekend at the St. Joseph District Competition. The EngiNERDs played to a 15-5-0 record throughout the competition, ranking fourth at the end of qualification matches. We were paired with the number one alliance of Team 3620, The Average Joe’s (from St. Joseph) and Team 1502, The Technical Difficulties (from Chelsea) and went on to take first place and win the competition in eight matches. 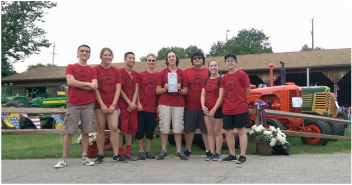 The EngiNERDs earned the Chairman’s Award, which is the most prestigious award at FIRST, and honors the team that best represents a model for other teams to emulate and best embodies the purpose and goals of FIRST. It was created to keep the central focus of FRC on the ultimate goal of transforming the culture in ways that will inspire greater levels of respect and honor for science and technology, as well as encouraging more of today’s youth to become scientists, engineers, and technologists. Our Team’s Safety Captain, Lily Eckman, received recognition as the “Safety Star of the Day”, along with #1 Pit Safety, and the “Hard Hat” industrial safety award from Underwriter Laboratories. If you missed the St. Joseph District, you can watch our matches at: https://www.youtube.com/playlist?list=PLw_-zRz0sues3iuNTeQ4zH5Z3G8RDbW_Z and see photos of the event on the Team’s Flickr Page at: https://www.flickr.com/photos/114174886@N08/sets/72157643217062153/ . Our next competition is at Troy Athens High School on April 4th and 5th. All events are free and open to the public, please feel free to join us. If you can’t make it, a live stream of the competition can be found at http://www.twitch.tv/firstinmichigan starting at 9:30am on Friday. Team 2337 competed at the Kettering University FIRST Robotics District Competition on March 6, 7 and 8. Throughout the qualifications, the EngiNERDs played to a 10-1-0 record, with 640 Assist Points. Along with the awesome alliance of Team 314, The Megatron Oracles from Carman-Ainsworth, and Team 5081, The Lumbernators from Bay City Academy, The EngiNERDs were able to sweep the eliminations and come home with gold. Media coverage for this event was featured in the Grand Blanc VIew, thanks to Paula Kay Schmidt, and match video archives can be found on Team 2337's YouTube Channel for Aerial Assist. Team 2337 would like to extend a grateful "Thank You!" to the people who have partnered with our organization for the 2014 FIRST Robotics Competition Season. Your continued support makes this amazing program possible! Interested in Partnering with the Grand Blanc High School Robotics Team? Click the button below for more information. Issue One of the EngiTIMEs Newsletter has been released! Want to know what the NERDs are up to, or how you can get involved in this awesome program? Please take a look at the latest and greatest in the EngiTIMEs, where you can find NERDy News Now!